The CBORD® Patient™ app is the next innovation in food and nutrition technology designed to transform patient meal ordering and get hospitals of all sizes to rethink their foodservice operations. CBORD Patient enables self-service meal ordering using your own device—or any hospital-approved mobile device—connected to CBORD foodservice and nutrition systems, maintaining diet order safety and compliance. 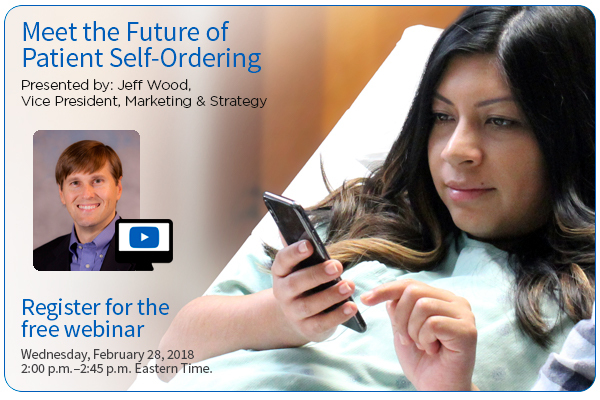 Join us for a free webinar presented by VP of Marketing and Strategy Jeff Wood, in which he describes both the ROI and health outcomes benefits of this innovative new CBORD technology. Questions? Please contact Mike Atkins at mta@cbord.com or 844.462.2673.